Luxury wine accessories company announces world premiere of new affordable, revolutionary VinLuxe wine aerator. 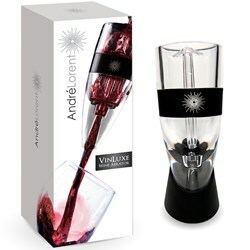 The VinLuxe Wine Aerator is 300% faster than a decanter and pours the perfect glass of wine in seconds. New York company André Lorent has always prided itself on designing accessories that make the luxury lifestyle accessible to anyone. Co-founder Ben Cummings feels that the company’s new VinLuxe Wine Aerator epitomizes that purpose. Cummings feels that the VinLuxe wine aerator takes one concern out of the equation so that wine lovers can spend more time enjoying their wines and less time decanting them. Cummings explains that wine aerators are becoming very popular these days, as the trend is that more American's are drinking wine than ever before. There are a few different wine aerators on the market today, and all of them use some method of mixing air into the wine as it’s poured. This not only separates the sediment from the wine, but also allows the oxygen to deepen and magnify the more subtle flavors. Without the breathing process, wines can be bitter or lack the subtle notes that wine lovers expect. The VinLuxe wine aerator distinguishes itself from the other models available because of its globally-patented three-step aeration process. The VinLuxe wine aerator has a sleek, modern design that makes it very visually appealing and comes with a 100% Lifetime Money Back Guarantee should it become damaged. VinLuxe is the only wine aerator to offer such a guarantee. The VinLuxe Wine Aerator is being sold exclusively through Amazon and comes with a free travel case, making it especially convenient for vacations, winery tours, picnics and wine tastings.